The Red Dragon island adventure takes you back in time to old Japan where you will run into a bunch of fun and exciting characters like sumo wrestlers and Samurai Warriors. Your goal is to go on a rescue mission but you will first have to learn some ninja skills to help you on your journey. Check out the walkthrough video and written walkthrough below for any help or questions you may have. Walk to the right until you see the tire swing. Jump up to knock it down. Push the tire to the left until you see the ladder hanging from the tree. Under the tree you’ll find Jack’s glasses. Place the tire under the ladder then jump on top of it to climb up to the tree house. Enter the tree house and take out Jack’s glasses to give to him. Ask Anne how it works. Pick up the book about Japan and take it out to use it. Exit the tree house and Jack and Anne tell you to go find a kimono. Walk to the left until you run into the guards. They take you to jail. She gives you 3 different kimonos you can choose from. Put one on and you’ll find a passport in the pocket. Walk to the left until you see Jack and Anne getting caught by the guards. Keep walking to the left until you pick up the rotten fish on the stairs. Go up those stairs and enter the doorway at the top. Jump over to the right side of the room and you’ll pick up some parchment. Now exit the temple and run to the right until you go over the red bridge. After you cross the bridge, go down to the water and get on the boat with the guy. Take out the rotten fish and he’ll say you should use it as bait. Catching the Kappa can be difficult but follow these instructions and you’ll be able to do it easily. Click on the pile of sticks to light the fire. 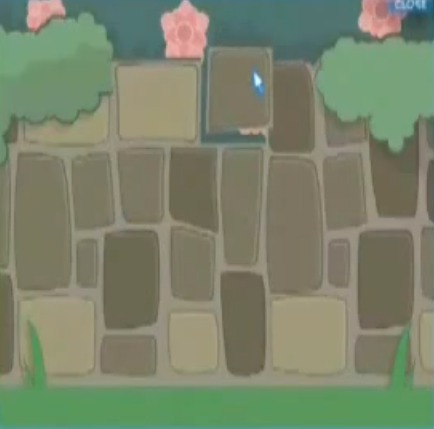 Click on the large rock to the right of the sticks to roll it over a hole. Now aim the bottom of the beehive towards the hole in the tree and click to block the hole with bees. Your net should be placed above the hole to your right. The fish should be placed on top of your net. The Kappa will jump out of the hole and into your net! It may take a couple tries to do it but this should work. The fisherman doesn’t give you anything in return for the Kappa. 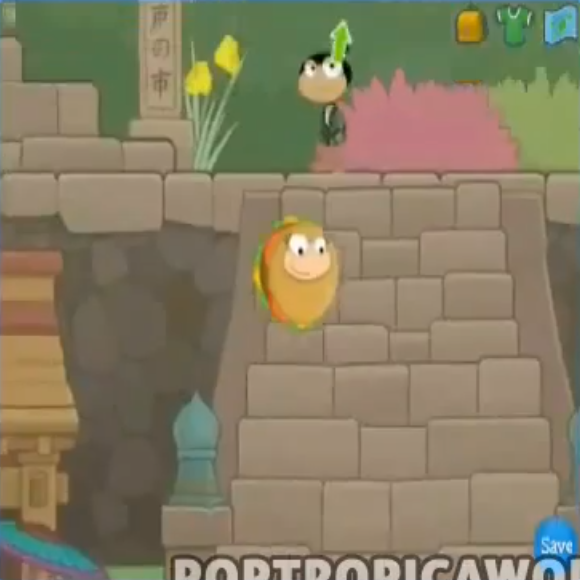 Jump up the cliffs to get back up on the bridge. 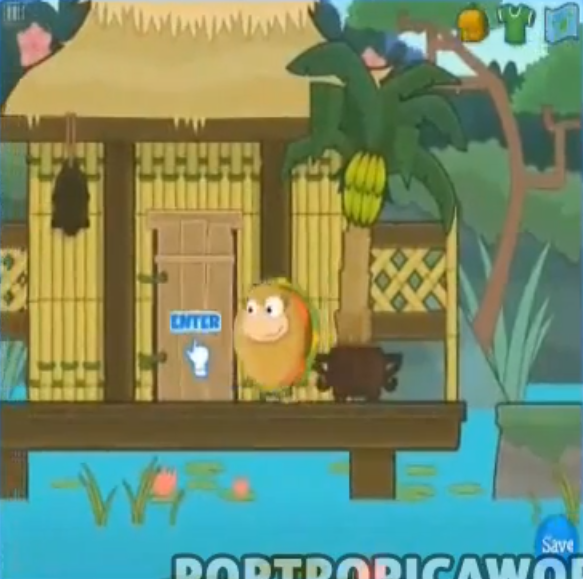 Walk to your left until you see a hut that looks like this. Go inside. Ask the man if he knows where you can find Ninja Master Basho. He laughs and says Basho is in town buting eggs. Run to the right until you see the guard standing with a group of people. The guard asks you to take his betting slip to the Sumo Match for him and he’ll split the winnings with you. Walk to the right until you see the man standing on the bridge. He says the bridge is in rough shape and can’t hold too many people at once. Take out your bag of mortar to help rebuild the bridge. Place the pieces in the right order to rebuild the bridge columns. Look at the picture below to see the correct order of the pieces. The man says that the sumo wrestlers can get to their match now. Walk to the right until you get to the bonsai store. Go inside and take out your scissors. She says she can’t see to trim the bonsai trees but that you should do it. Take your time and cut the right pieces off the tree to get it to match the old one. After you cut it, exit the store and walk to the left until you get to this set of steps. Go up the steps and enter the doorway to the left. Walk to the right and talk to the guy next to the sumo wrestler. Ask him if you can help. He asks you to copy a notation for him. Trace his writings as best as you can on the letters to his fans. There are quite a few of them so have patience. He thanks you for your help, now walk to your right until you see the sumo wrestler standing by himself. Ask him if there’s anything you can do to help. He wants you to take his place in the ring! Jump up in the air when your opponent stomps the ground and jump over him when he charges you. If you avoid him for long enough you win the match. The guard comes back and is angry that you lost his bet. Then the Ninja Master comes and saves you by telling the guards you are his student. He says to meet at his house when you are ready. Exit the sumo arena and go down the stairs. Now walk to your left until you see the Ninja Master out in front of his house. He says he saw your good deeds around town and wants to train you. First you must put on your ninja outfit and then climb the tree to your left to get the claws. Jump down from the tree and throw your ninja stars at the rope and at the candle. 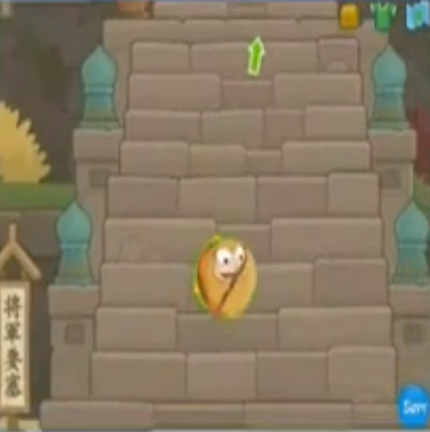 You must complete the Ninja Master’s training course, he shows you how to use all of the weapons and new ninja items. Follow him to the right and he gives you a rock puzzle to figure out. Look at the picture below to see where the pieces go. He says your training is over and you should go rescue your friends. Lastly he asks you to bring him the Shogun. Run to your right until you get to these temple steps you were at earlier. Enter the temple and climb up to the right. Now you must climb up the shaft by jumping from wall to wall. Keep climbing the walls up until you see the rope hanging down. Climb up the rope and jump over to the right onto the grassy area. Jump back over to the left to climb up the next rope. Keep climbing up the walls and watch out for the logs that ram across the gaps. You have to jump on top of some of them to reach the top. Use your ninja vision to look around and see where the guard is. When you walk up to him, throw a smoke bomb at him then run past him. Climb up the wall and enter the building through the window. Walk to the right and throw a ninja star at the rope to move the blockade. Drop down and use your rope gun to shoot the gold ring and swing across the gap. Drop down past the guard and use another smoke bomb on the next guard you see. Run past him and keep going to the left where you’ll see the two bags of mortar. Climb up that wall and you’ll find a gold key at the top. Now go back to the left and throw another smoke bomb at the guard. Run by him and work your way over to the right. You have to use your rope gun on another hook to jump across the gap. Enter the wooden door at the top right of this room. Use your throwing stars to take out the lights and smoke bombs on any guards in the way. Drop down into the bright area and use your rope gun to get across the gap to then next gold key. After you get the key, swing back across the gap and over to the right. Use another smoke bomb to get past the guard. Climb up the rope and throw another smoke bomb at the next guard. Jump up onto the wall and use your rope gun to hook onto the gold ring. Swing up to the next wooden door and go inside it. Use a ninja star to take out the light then use your rope to swing across the gap. Throw ninja stars at the two ropes holding the barriers and then throw a smoke bomb at the guard below. Run past him and climb down to get the next key. Drop down below and climb on the crate. Jump over the guard onto the next crate then drop down and pick up the piece of the haiku. Jump up and throw a smoke bomb at the next guard then run by him. 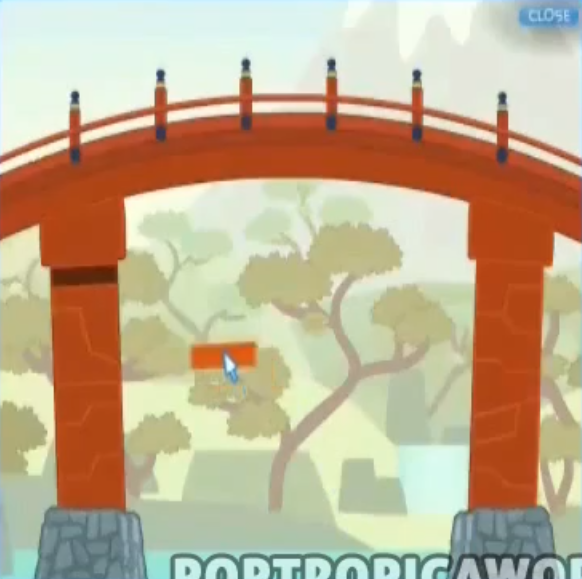 Cut the rope on the bridge with a ninja star. Walk to the left and use your stick to block off the darts flying at you. Climb all the way up the wall then drop down on the other side. Use your stick again to keep darts from hitting you. Walk to the right and use your rope gun to swing across the gap. You have to throw a ninjas star while swinging so you’ll have a place to land. Enter the wooden doorway and walk to the right. The Shogun will say he’s hidden the key somewhere. Take a few steps back and throw a ninja star at the rope holding the cage. After your friends are free, the Shogun summons the red dragon and it shoots fireballs at everyone. You end up on the mountain and have to climb to the top to find the cloud dragon. Jump up the mountain and click on the cloud dragon to hop on it. Fly around and shoot at the Red Dragon to keep it from destroying the buildings. Eventually you’ll defeat the red dragon after you shoot him enough. You bring the Shogun back to the Ninja Master and it turns out they are brothers. Use the magic amulet to get back to the tree house and use the hometown book to get back home. When you safely get back, Jack and Anne will give you the Red Dragon Island Medallion. Congratulations! The Red Dragon Island Walthrough was really one of my favorite ones to do. There was a lot of great things you got to do here not to mention the cool charcters you run into! I hope the video above helped you get through it! Don’t forget to check out our facebook, twitter, youtube, pinterest and google+ accounts! 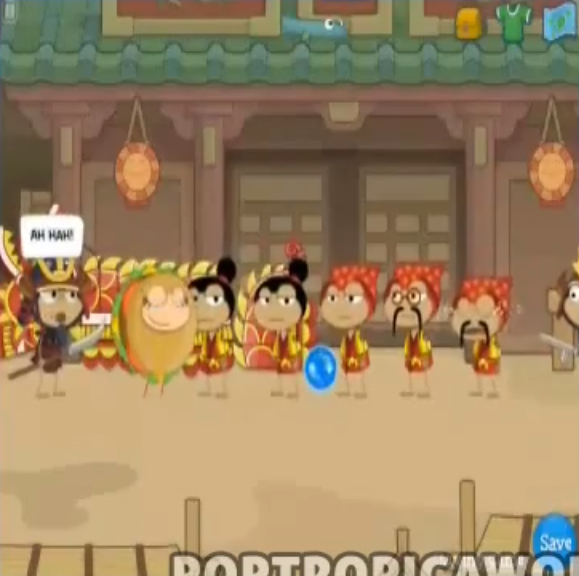 i dont know how to get to the dragon its so hard and i looked very close to your words AND video plz help! Plz can you tell me how to get to the door in fortress 3? Please email or get back to me somehow! 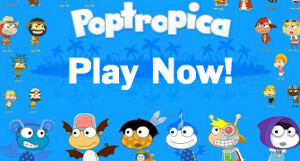 I love your website it really good but I just cant get through the fortress on this one. Do you think there is a way I can give you my account and you can do it for me? It’s really crazy but I believe you wont do anything bad. PLEASE REPLY ON EMAIL OR BACK ON COMMENTS OR SOMETHING! IM DESPERATE. I can’t get past the last door! Anybody Help!